Another Victory for the Greyhounds! The Greyhound Protection Act is now on Governor Lynch's Desk. Please contact him today and ask him to sign it! Tom Fahey, “Dog racing may be gone forever,” Union Leader, June 29, 2009. Chris Garofolo, “Greyhound park files for bankruptcy,” Brattleboro Reformer, December 16, 2008, reformer.com (accessed November 15, 2017). 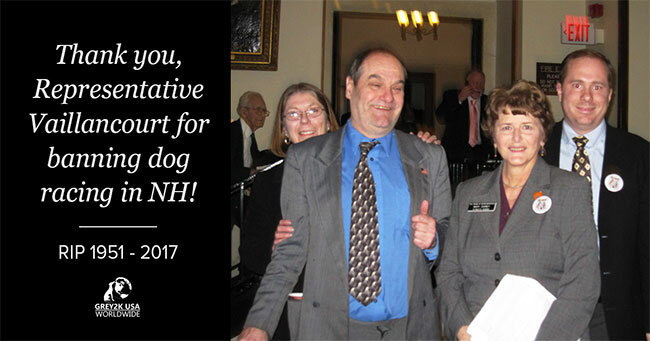 “Statement by GREY2K USA on the Signing of House Bill 630 by Governor John Lynch and the End of Greyhound Racing,” GREY2K USA, July 8, 2010, prnewswire.com (accessed November 15, 2017).